Crowns cover and restore a tooth to its normal shape and size. A crown can make your tooth stronger and improve its appearance. It can cover and support a tooth that has a large filling when there isn’t enough healthy tooth left. It can be used to attach a bridge or removable partial denture, protect a weak tooth from breaking, or restore one that’s already broken. A crown is a good way to restore teeth that are discolored, badly shaped, or severely crooked. It’s also used to cover a dental implant. 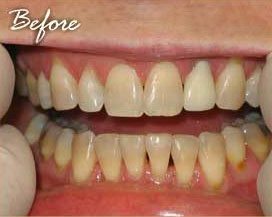 If you have ever had the crown procedure performed on one or more of your teeth then chances are that you went to your dentist for the initial crown preparation appointment, during which your tooth was numbed, the work was performed on your tooth, an impression was made, and a temporary crown was made. You then went back to your dentist for a second appointment in about 3 weeks to receive your permanent crown. During that 3 week period, you had to be very careful about eating on and around your temporary crown, and if you were really unlucky, your temporary crown may have fallen off causing sensitivity and inconvenience until you could see your dentist to have it put back on. Our office is one of only a handful in the Golden Triangle area that can make your permanent, all porcelain crown in a single appointment utilizing the E4D/Planscan System. No second appointment. No temporary crown. Imagine not having to have the same tooth numbed a second time! You can eat whatever you want just hours after the appointment, instead of eating a restricted diet for 3 or more weeks. The quality of the crown is the same or even better than that of a traditional crown made at a dental laboratory. Dr. Ferguson and Mary Higgins, lead dental assistant, have been extensively trained at the D4D institute in Dallas, Texas, to utilize this amazing technology and have already performed hundreds of cases with tremendous success. If a crown is part of your treatment plan, Dr. Ferguson will be happy to determine if an E4D/Planscan System single appointment crown is right for you. This patient was involved in an accident that broke her two front teeth to the point that they both required root canals. 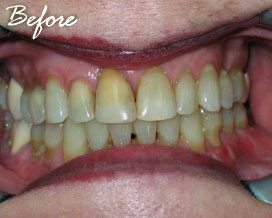 After the root canal treatments were performed on both teeth, we then performed all porcelain crowns on the teeth to correct the form and color of the teeth. 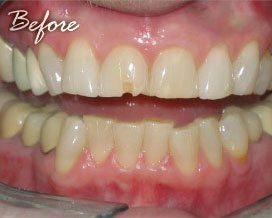 In this case, we used ZOOM in-office whitening to get this patient’s teeth their whitest. 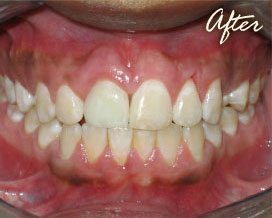 We then replaced all of her old, stained fillings on her front four teeth with all porcelain crowns. The results are tremendous. 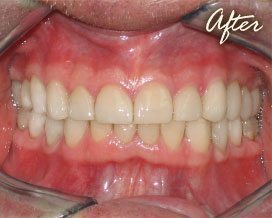 Due to severe wear on his teeth that was secondary to bruxism (grinding), this patient required full mouth reconstruction which included opening his bite to restore vertical dimension and all porcelain crowns on all 28 of his teeth. 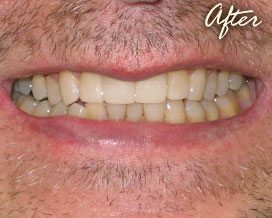 In addition to opening his bite back to his original vertical dimension, crowns allowed us to replace multiple leaking, old restorations, and create a beautiful new smile. 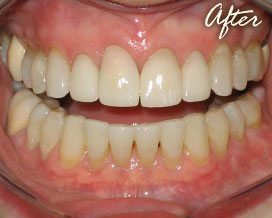 Once we got this patient’s oral hygiene up to par, we used all porcelain crowns to restore the front teeth that were devastated by fractures and tooth decay. 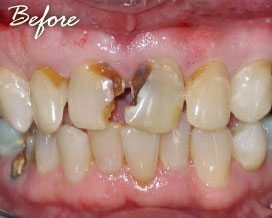 The results speak for themselves (and there’s still more restorative work to be done!). Composite fillings are a mixture of glass or quartz filler in a resin medium that produces a tooth-colored filling. 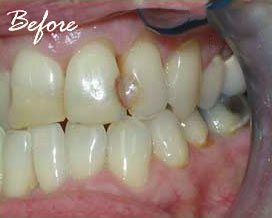 Composite fillings provide good durability and resistance to fracture in small to mid-size restorations that need to withstand moderate chewing pressure. Less tooth structure is removed when preparing the tooth for a composite filling, and this may result in a smaller filling than an amalgam (metal) filling. 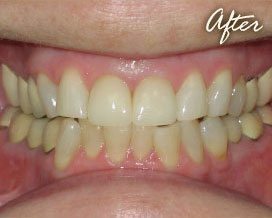 We replaced this patient’s old, stained, leaking fillings on her front teeth with new, composite bonded restorations. 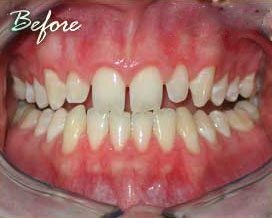 What a quick and conservative way to improve the appearance of her smile! Composite bonding is great to use when the dental problem is small enough that more involved treatment, like all porcelain crowns or veneers, is not necessary. 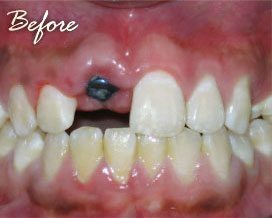 This patient wanted to close the gap between her front teeth. 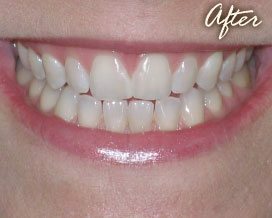 We did just that using composite bonded fillings on both of her front two teeth. She is thrilled with the results! Dental implants are a wonderful way to replace missing teeth. Maybe the best thing about a dental implant is how versatile it can be. An implant can be used to replace anything from a single missing tooth to an entire arch of missing teeth. An implant is placed in the jawbone and the bone around the implant is allowed to heal. 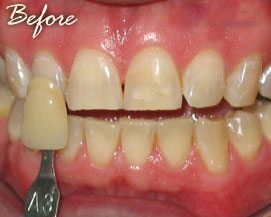 Then the implant is restored with a crown or bridge if you only need to replace 1-4 teeth. If you need to replace more teeth, the implant can be restored with an abutment which can help support a removable partial or complete denture. Our office is also pleased to offer the revolutionary “All-On-4” option in which case we use 4 implants to replace an entire arch of missing teeth with a prosthesis that does not come out of the mouth. There are so many uses for implants today, and our office believes that no one should have to go without teeth anymore! This patient was born without several permanent teeth. 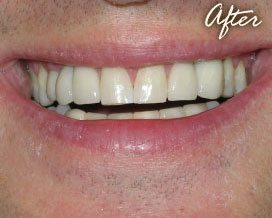 We used multiple implants and implant supported all porcelain crowns and bridges to replace the missing teeth and improve his smile and function. 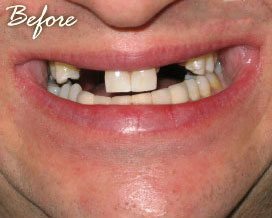 This patient lost his two front teeth years ago in an accident. 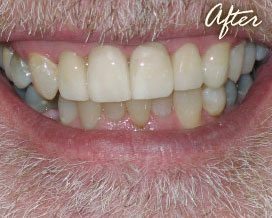 He was sick and tired of his removable partial denture, so we replaced the teeth with two implants and implant supported all porcelain crowns. 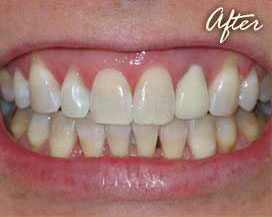 We also whitened his teeth with ZOOM in-office whitening before the final crowns were made. He is thrilled with the end result! Lateral incisors were the problems in this situation. 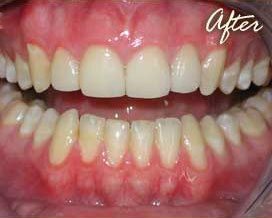 This patient was born without her right lateral incisor and her left one was too small and had a mottled appearance. 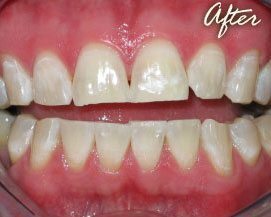 Her missing tooth was replaced with an implant and all porcelain implant crown, while her undersized tooth was restored with an all porcelain veneer. 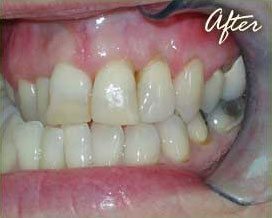 A gingivectomy, a minor surgical procedure to remove excess gum tissue, was also performed on her left side to make the veneered tooth appear longer. This patient was injured playing basketball causing him to lose his central incisor. His tooth was replaced with an implant and crown. The before photograph was taken after surgical implant placement but before the permanent crown was placed. 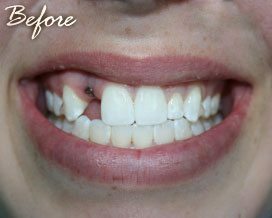 A veneer placed on top of your teeth can correct nature’s mistake or the results of an injury and help you have a beautiful smile. 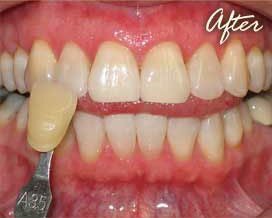 There’s no reason to put up with gaps in your teeth or with teeth that are stained, badly shaped, or crooked. 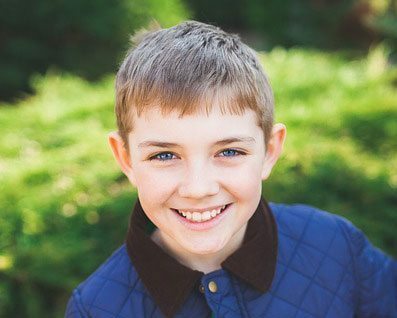 Veneers are thin, custom made shells crafted of tooth-colored materials such as porcelain, designed to cover the front side of teeth. We will be happy to discuss whether veneers may be a good option for you. This patient had never been happy with the shape of his teeth. 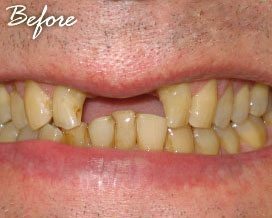 He didn’t like how his teeth appeared too small, resulting in large spaces between the teeth. We performed all porcelain veneers on his upper, front four teeth and corrected nature’s mistake. He can now smile with confidence. This patient’s front two teeth were worn and chipped. 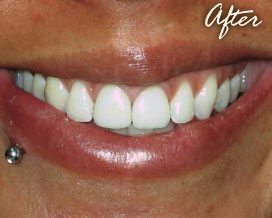 She wanted a solution to make the teeth look more natural, longer, and more youthful. 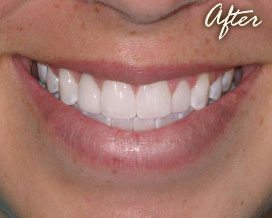 We performed veneers on her front two teeth to cosmetically enhance her smile. No single element of your smile stands out more than bright, healthy, white teeth. Whitening is the most conservative and cost effective way to brighten your smile. We are pleased to offer an assortment of whitening options for our patients. Dr. Ferguson or any member of our staff will be happy to help you decide which option may be the best fit for you. ZOOM is the in-office whitening system that our office uses and is the quickest and most powerful way to whiten your teeth. 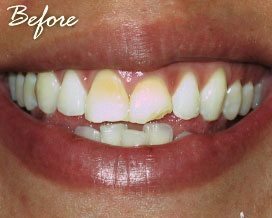 During the ZOOM appointment, bleaching material is applied to your teeth in either three or four 15 minute sessions. This bleaching material is activated by our ZOOM light during these sessions. The appointment lasts about two hours. 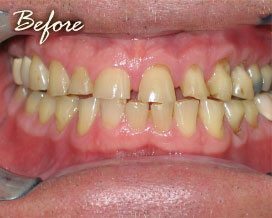 As part of this treatment, our office makes you custom take-home bleaching trays for future use with our at-home bleaching system so your teeth keep the beautiful, white shade that they achieve during the ZOOM appointment. 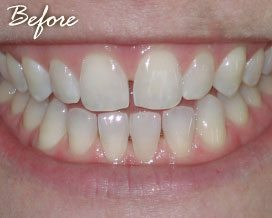 Another effective method of whitening is with our custom bleaching trays. 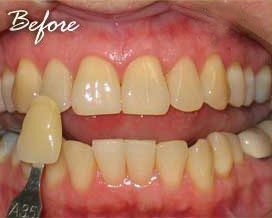 We begin by making molds of your teeth from which we make custom trays and you simply apply the bleaching material yourself in the comfort of your home. You can bleach when it is convenient to you, and you can control the rate at which your teeth whiten. When you run out of bleach, just come by our office and get more. SheerWhite is a breakthrough whitening system that can also be done in the comfort of your home and on your schedule. With SheerWhite there are no molds to be made of your teeth and no custom trays. You simply purchase a SheerWhite kit from our office and everything you need to be on your way to a brighter smile is in the kit. It’s that easy! Don’t wait until it hurts! The American Dental Association recommends that people see a dentist twice yearly for periodic checkups/exams and professional teeth cleaning appointments. 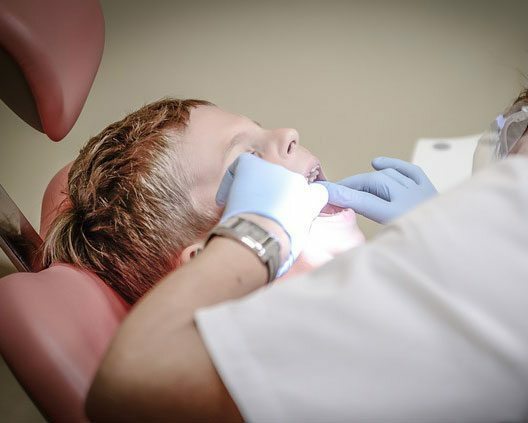 The treatment philosophy of our office is to provide comprehensive dental care to all of our patients, which means putting special emphasis on diagnosis, prevention, and early treatment of certain dental problems. These preventive appointments enable us to catch many small dental problems before they become large dental problems. Our professionals also utilize yearly X-ray examinations as well as thorough examination of the head, neck, tongue, and other soft tissue to help catch most problems early.